Counselors work with children, adolescents, young adults and families in their schools, homes and/or communities to help decrease stress and increase positive behaviors while improving familial relationships. Counselors use a variety of techniques including play therapy, cognitive behavioral therapy and client centered approaches while maintaining a strength-based perspective. Individual and family counseling is provided to the family as often as the family and/or referring party requests. 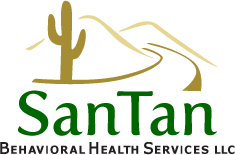 All Counselors have Masters Degrees and work under the supervision of an Arizona Board of Behavioral Health Licensed Professional. San Tan strives to hire counselors who are general practitioners, as well as those who specialize in the needs of the communities that we serve; for example, trauma & substance abuse. While most counseling services are provided in the community, San Tan does have offices that are equipped for counseling services should any of these locations be a more suitable and therapeutic environment for specific clients. Additionally, San Tan currently offers a specialized Birth-to-Five program under the general umbrella of Community Based Counseling. Triple P Parenting is a nationally recognized program with very successful outcome measures, and San Tan currently has staff certified in administering services under this program. With Triple P, a qualified clinician meets with families in their homes or a San Tan office and provides specific developmental education and hands-on parenting skills training.